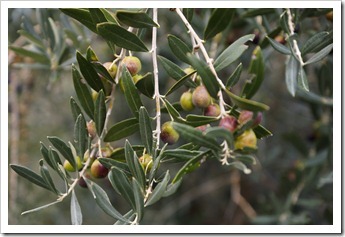 And so goes the rush of the olive harvest in late-Autumn all across Italy. After lovingly pruning the trees in late winter, then fretting about frost and bugs and drought through spring and summer, families come together in a rush to harvest their treasured olives at just the right moment in November, and hopefully before the winter rains set in. 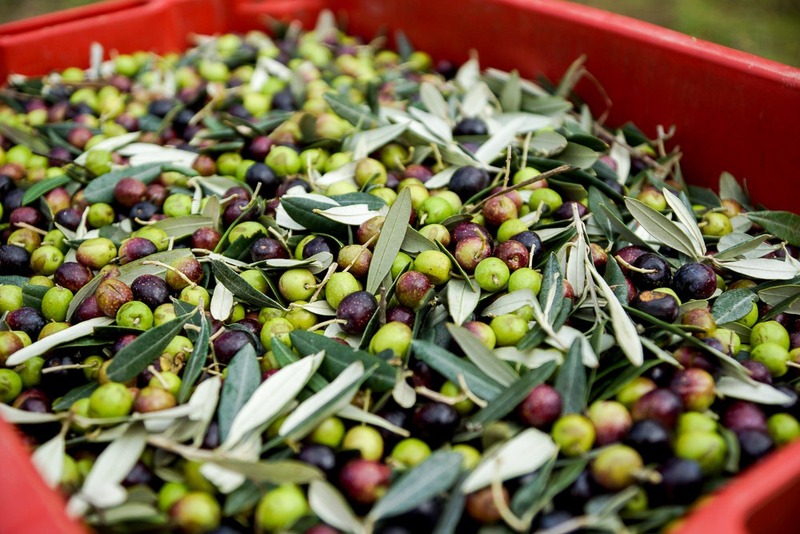 Failing to collect and press the olives in time can lead to poor harvests and little oil to go around to the family member for the year’s eating and cooking needs – a disaster by Italian standards. 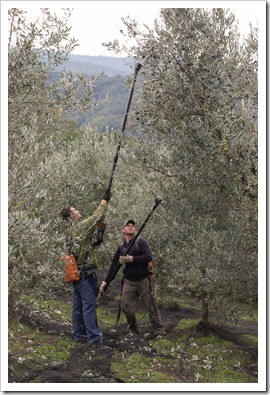 The Italians treat their olive trees like cherished members of the family. Olive trees grow slowly and live a very long time – some trees in Puglia date back 800 years – and their place in the rhythmic cycle of Italian life is respected and celebrated. In Italy the olive trees that you grow up with on the family farm were likely planted 10-20 generations before your time. Family farms stretching from northern Tuscany & Liguria south to Sicily tend small groves of olive trees with the goal of pressing and bottling enough oil for the family. 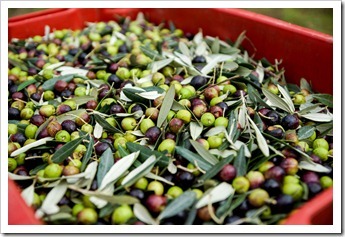 Italians traditionally use olive oil throughout the year, with small families using up to a liter of oil every week. 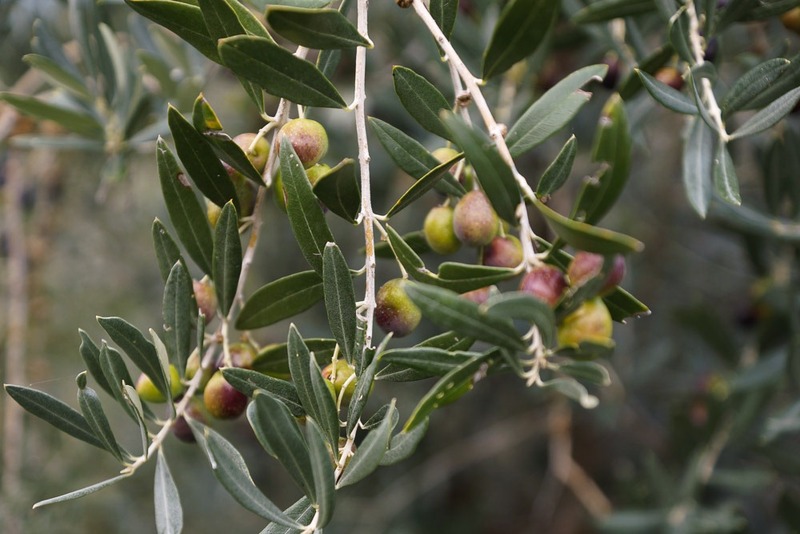 Nearly everyone knows someone who has oil pressed from family-owned olive trees, and each year’s harvest is shared amongst the extended family members. 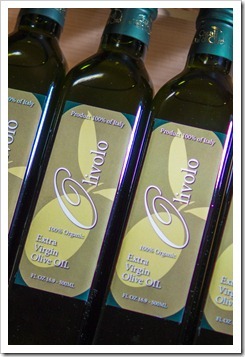 Some family farms sell their olive oil if they have enough left over. Each Winter I’ve been able to coax my Tuscan friend Arnaldo to sell me a few bottles of his prized family oil – just enough for my family’s needs. It’s mid-November and we’re catching up on life over a glass of Barolo at Pane e Vino in Cortona when I make my request. “This year I’d like to import oil for my friends back home,” I say, leading into my request. Arnaldo has a serious look on his face. He knows where I’m going with this. “This year we’ve suffered a terrible drought, and the olive harvest will be small.” That’s Arnaldo’s gentle way of telling me that he won’t be parting with his oil. There simply won’t be enough to go around. “The first pressing lets us taste the true essence of this year’s olives,” Lidia explains as we walk her olive grove on this chilly but dry November day. She’s talking about olio nuovo, or new oil – freshly pressed olive oil that is a rich, verdant green and tastes of, well, olives as they were meant to taste. 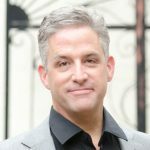 We Americans have been raised on bland, tasteless, yellow olive oil that is mass produced and likely years old. 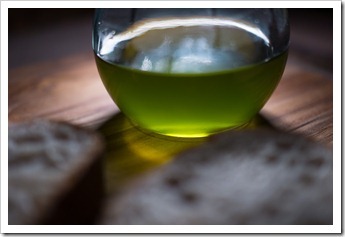 Unlike wine that can benefit from a little aging, olive oil deteriorates with age – the sooner you use it, the better it tastes and the healthier it is for you. 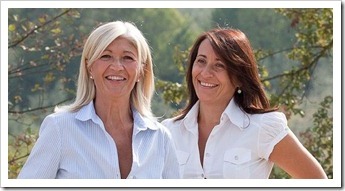 Lidia Castellucci and Roberta Giaccherini manage a family-owned farm named Buccelletti in the verdant Chio Valley just outside of Cortona in Tuscany. Nestled amongst the grapes and sunflowers and corn are olive groves that are hundreds of years old and lovingly tended by the locals. When you’re harvesting from hundreds of trees like Lidia and Roberta do, picking by hand is not a practical option. Instead, harvest is done with what looks like a pitchfork at the end of a gas-powered, 8-foot long handle. 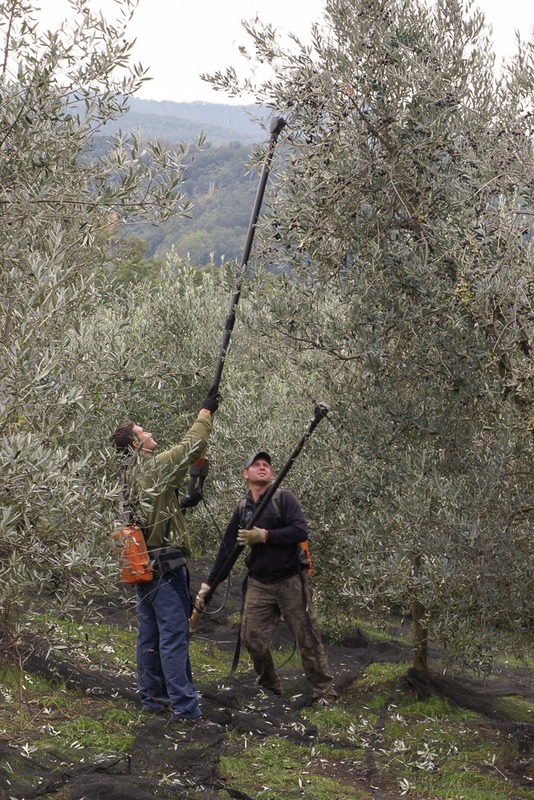 Pickers slip the tines of the pitchfork high up into the limbs of the olive tree, fire up the engine and the tines rapidly (but gently) vibrate the limbs and knock the olives loose. 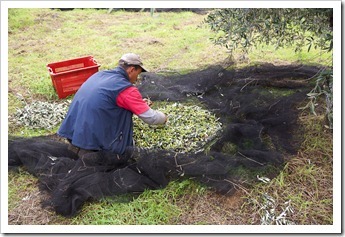 As a result, olives fly everywhere, landing on the ground where they’re caught in fine nets spread under the olive trees. 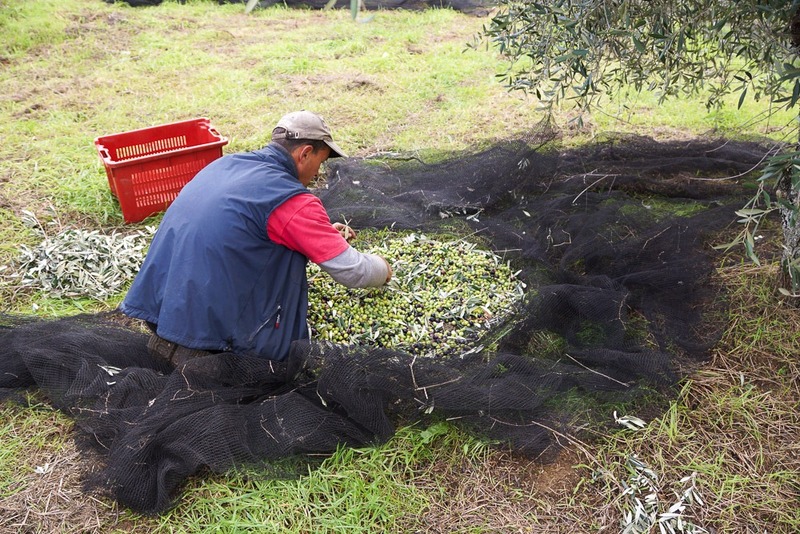 Once on the ground, pickers do a quick sort of the olives to remove fruit not worthy of oil, gather up the net and collect the olives into bins. 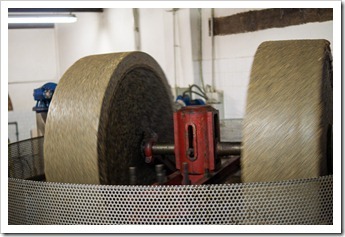 Leaves and small twigs are removed prior to pressing. 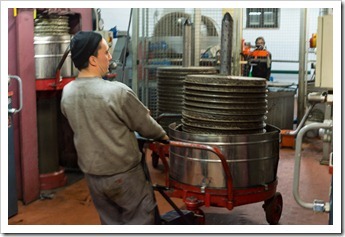 Pressing olive oil is serious business in Italy, and not just anyone can do it. Locals take their olives to a community olive press called a Frantoio where they wait their turn to have their olives pressed. If you’re a local small family with a modest olive harvest, you simply drop off your olives at the nearby Frantoio Cooperative in exchange for an agreed upon number of kilos of olive oil (oddly, olive oil production is measured in kilos of oil and not liters). 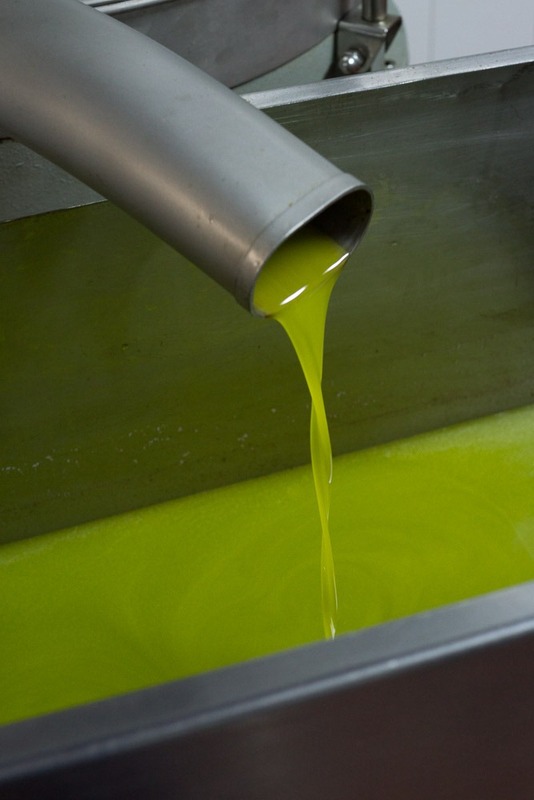 The oil you get is a mélange from all of the other local small producers – very good extra virgin oil of high quality, but definitely not from “your olives.” This is the most economical way of turning your olives into olive oil. Family farms with a large olive harvest take their olives to a private Frantoio where they get a batched pressing of just their olives. This is the only sure way to turn your olives into your oil. This is how Buccelletti turns their olives into Olivolo – their fresh-pressed, organic extra-virgin olive oil named after the local dialect for the Moraiolo olives grown on their farm. Ancient methods meet modern methods. 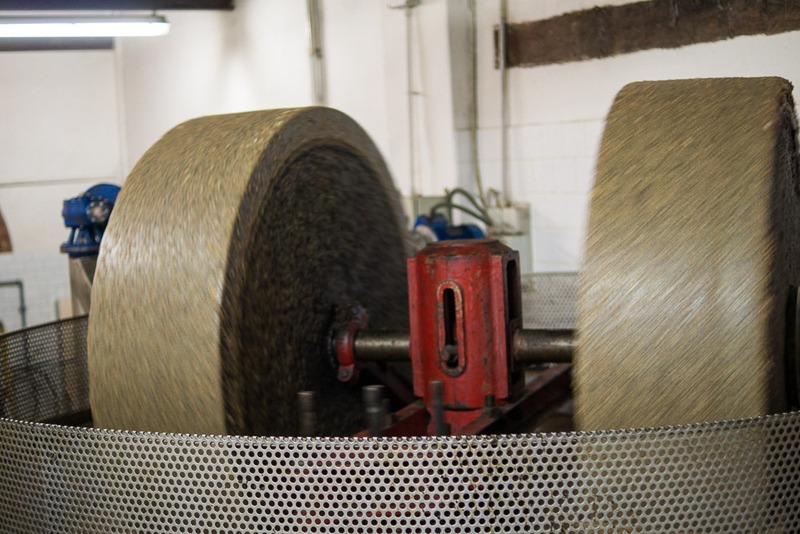 Once upon a time, olives used to be pressed with huge, weighty granite wheels turned round-and-round by a beast of burden, and the resulting olive paste was placed on straw mats and pressed with a large, hand-turned vise. As the mash was pressed, oil and water collected in a pool where it was left to settle as the oil floated to the top over a period of days. It’s all wonderfully romantic, but not so practical in today’s hurry-up-and-press-it world. These days, some of the romantic past is preserved, but more practical equipment is used to get the job done. 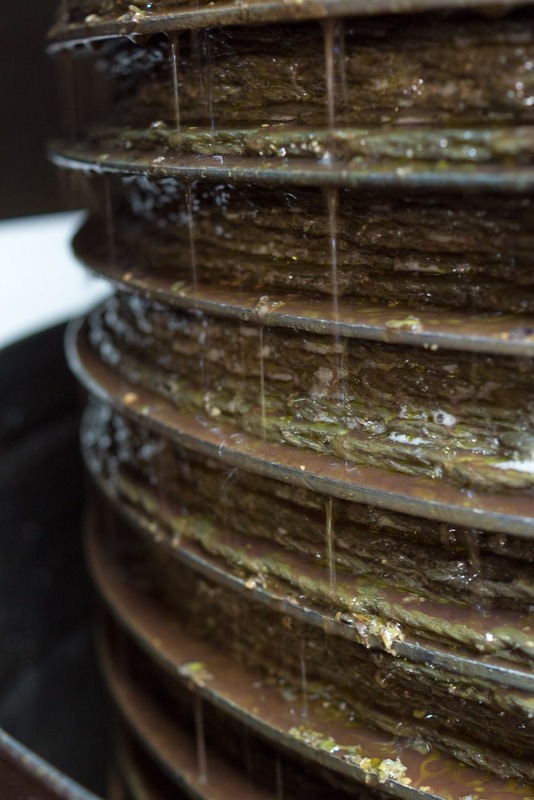 Once the olives are pressed by the stone wheels and turned into an oil-laden paste, this olive mash is layered onto special mats that are stacked 20+ high on a spindle, then rolled over to a hydraulic press for pressing. 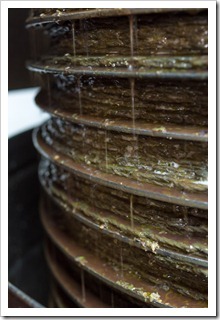 Here’s where the magic takes place: The stack of olive mash is gently (but strongly) pressed to release the oil and water, which drip down the sides of the stack into a collection pool. This emulsion of oil and water from the olives is then gently pumped over to a centrifuge where the oil is separated from the water. 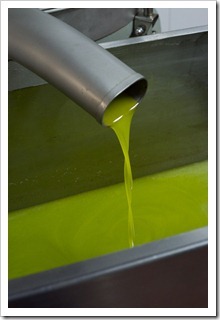 The result is a vibrant green, dense oil that tastes purely of organic olives. This is truly how nature intended it. Once pressed, Lidia and Roberta bottle their organic olive oil unfiltered, and that makes all the difference in taste and health. The bright green new oil has an intense fruitiness with artichoke and grassy notes, and the classic Tuscan pepperiness on the finish. 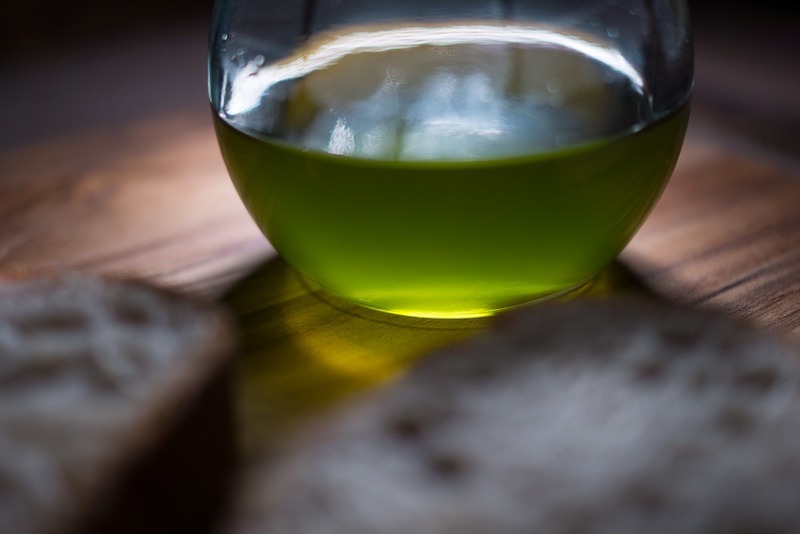 Italians believe that freshly pressed and unfiltered olive oil is also wonderfully healthful and reduces the risk of illness – and that’s one of the reasons why many enjoy olive oil on a daily basis. Taste and health go well together. 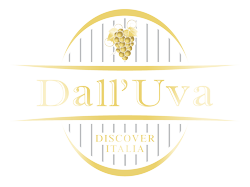 Lidia and Roberta are very busy women – in addition to the olive harvest, they produce some interesting local wines as well as manage an agriturismo with a collection of casali rental homes sprinkled throughout the Val di Chio and just 9 miles from bella Cortona. They are happy to greet you at their place in the hamlet of Santa Cristina for a tasting of this year’s olive oil, or a degustazione (sampling) of their wines. Finding them: Buccelletti is located about an hour south of Florence and just outside the medieval town of Castiglion Fiorentino, right off SR71 at Via Santa Cristina, 16, Castiglion Fiorentino (AR) 52043. It’s usually best to make a reservation if you’re planning a visit, which is easy to do: you can reach Lidia and Roberta by phone at +39.0575.650.179, or by E-mail at info@agricolabuccelletti.it. After tasting many Tuscan estate-grown oils this past fall, I chose the superb Buccelletti Olivolo to be our first olive oil we have ever imported. Even though the Tuscan harvest was one-half of normal due to the drought this past year, I’ve been able to secure a limited number of 250 ml, 750 ml and 3 Liter bottles of Olivolo for fans of fresh pressed, extra-virgin olive oils. Many olive oils from Italy are imported by boat and get baked in the tropic sun as the shipping container progresses through the Panama Canal to the west coast of the US. Not ours. We’ve flown over our bottles of Olivolo to ensure their integrity, and our oil is direct from Lidia and Roberta’s cantina. 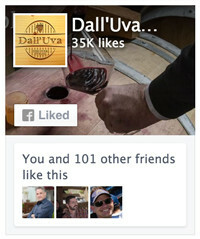 If you’d like to taste extra-virgin olive oil as it was meant to be, you can find Olivolo in the Dall’Uva Store. Drizzle it on crusty bread, sprinkle it over fresh spring salad greens, or pour a thin stream on a grilled-rare steak. Buon appetito!